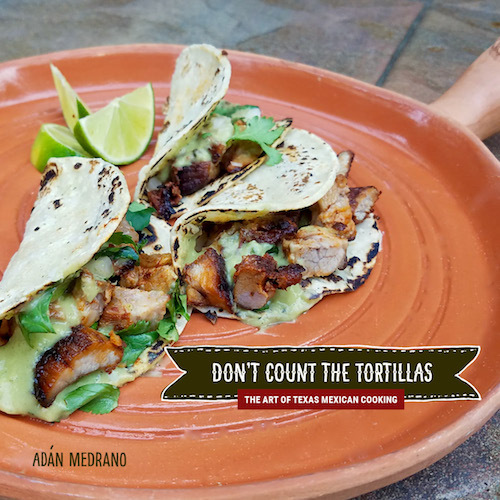 The cover of my new cookbook admonishes you, “Don’t Count The Tortillas.” My amá, mom, told me this dicho, saying, when I was a small boy, and it refers to “The Art Of Texas Mexican Cooking.” Within a couple of weeks Amazon, Barnes & Noble and other vendors will start selling the book. It will hit bookstores in early summer and I’m thrilled to share my love of food with you. I believe that cooking is an art, and I demonstrate this with 102 recipes that I’ve tested in my kitchen. I include both cherished family traditions and exciting innovations. You’ll find go-to favorites like picadillo tacos, tacos al pastor, and chilaquiles, with easy to follow step-by-step instructions. For the gourmand, you’ll enjoy new culinary surprises like Chipotle Cream Cherry Tomatoes and Chile Con Queso Soufflé. My wish is that this Texas Mexican cookbook will help fill your kitchen and home with joy and friendships. You KNOW that I’ll be in line to have this treasure within reach! Will there be book signings in San Antonio?